When I was kid, The Movie Channel was the only way to see a lot of movies I wouldn’t otherwise have seen (besides the video store, of course). HBO was sticking more to original programming and box office successes, so it seemed as if The Movie Channel got everything else. Ah, the days of cable. And it was during that time that Eve of Destruction started making its rounds. 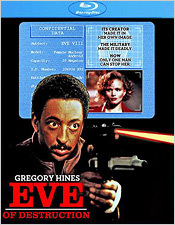 For those who haven’t heard of it before, Eve of Destruction is a science fiction/thriller about a cyborg named Eve, which is designed as a bio-weapon for the military. It’s also been built to look like its creator (Renée Soutendijk), as well as programmed to experience her emotions. But when it suddenly gets loose and begins running amok, it’s up to its creator and a military specialist (Gregory Hines) to either contain it or destroy it altogether. So yeah, it’s not the most original plotline out there, but it has a few things going for it. For Scream Factory’s release of the film on Blu-ray. they’ve managed to get their hands on a very good transfer of the film. Although the images appear soft at times, there was a remarkable amount of detail found within an excellent grain structure. The film’s color palette is well-represented, although skin tones to were not as accurate. Shadow detail was also very good, and contrast and brightness were at generally pleasing levels. I also didn’t detect any signs of digital enhancement and there were some very minor film defects to be spotted throughout the presentation. The film’s soundtrack, which is a single English 2.0 DTS-HD track, features a pretty good dynamic soundtrack. Dialogue is always clean and clear, and both sound effects and score have plenty of room to breathe. It isn’t a state-of-the-art surround experience with a lot of punch to it, but for a stereo track, it’s quite good. Unfortunately, there are no subtitles to accompany the film. Also unfortunate is that the only extra to accompany the film is the original theatrical trailer, which is welcome, but it’s a shame that there were no EPK materials to be dug up. But then again, it’s not like the movie is a high priority release. It has a very minor fan base, and just getting the title on Blu-ray at all is good enough, but I have to judge these things accordingly. It’s still a title worth checking out, in my opinion, with a satisfactory presentation.